The most common (and only officially recognized) races of African Grey Parrots are the "Congo Greys" (Psittacus erithacus) and "Timneh Greys" (Psittacus timneh). The Timneh was until recently considered a sub-species of the Congro Grey. However, in 2011, the Timneh and Congo Grey Parrot races were officially separated based on genetic, morphological, plumage and vocal differences (Ref. research by Melo and O'Ryan - 2007). One criteria for splitting up the two species was the fact that these two species don't interbreed within their natural habitat. However, Congo Grey / Timneh Grey hybrids have occurred in captivity (for example, Libby, a Congo-Timneh Hybrid African Grey Parrot - image published on www.griffinexotics.com/). Even though Congo-Timneh crosses are VERY rare, they are said to be viable and fertile (able to produce young). 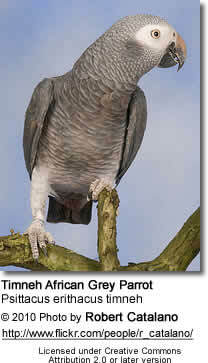 These hybrids are smaller in size than the Congo African Grey with the darker grey plumage of the Timneh. Congo African Grey Parrot or CAG (Psittacus erithacus erithacus - Linnaeus, 1758) - nominatea. African Greys are magnificent birds that are perhaps some of the most talented mimics of the avian world. Hand-fed birds make excellent pets and are perfect when a quieter parrot is in order. They are sensitive and very intelligent. Toys are a must for these "bird brains" as well as an affectionate owner. Grey parrots of any race generally make wonderful pets - although some prefer one over the other - depending on their personal experiences and what species they are more familiar with. Those favoring the maroon-tailed, darker Timnehs are suggesting that this species tends to be calmer and less nervous of new situations and people; and that they do better in family settings, while the lighter-grey, red-tailed Congos prefer one-on-one relationships. I have seen exceptions to both rules. In any case - speaking personally - there hasn't been an African Grey yet, that I haven't fallen in love with. Grey Parrots usually bond with one person. They wouldn't do well with most children, as they are not very patient and will bite if they are being handled. Mind you, which parrot wouldn't ... For kids, I would always recommend parakeets and cockatiels.